For 2019, the Suzuki Intruder receives some styling changes and a few added comfort features; remains unchanged mechanically. 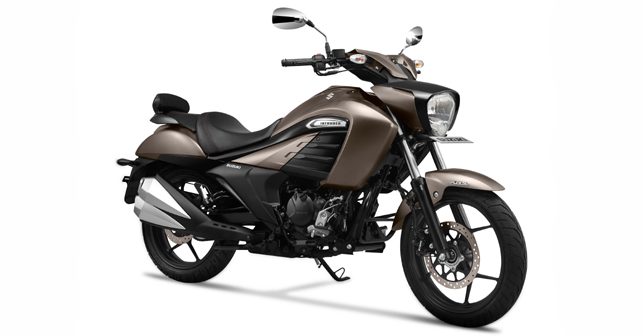 In order to remain noticeable in the 150cc motorcycle segment, Suzuki Motorcycle India Pvt Ltd (SMIPL) has updated its the Intruder for 2019. As part of the update, the economy cruiser gets a bunch of cosmetic updates. However, no changes have been made to the bike's mechanical specs. At ₹ 1.08 lakh (Ex-showroom, Delhi), even the price remains the same (as of the outgoing Intruder FI). The biggest change in the 2019 line-up of the Intruder is the introduction of a new colour scheme - Metallic Matte Titanium Silver. Further, Suzuki claims that the 2019 version has been updated in order to make it more comfortable. This has been achieved by revising the design and placement of the gear shifter as well as the rear brake pedal. Based on a quick comparison, we also noticed that the new Intruder loses out on its lower engine cowl, leaving the frame and leg protectors exposed. Even the front foot pegs seem to have been tinkered with. The comfort factor has also been enhanced for the pillion rider, with the addition of a fixed backrest. As mentioned before, the 2019 Intruder carries over the same mechanical specs as its predecessor. It is powered by the same 155cc air-cooled motor which does duty in the Gixxer. The single-cylinder power unit, mated to a 5-speed gearbox, develops 14.6bhp and 14Nm of torque.